Need New Recipes for Thanksgiving? For Thanksgiving, I’ve been working on recipes that taste fantastic, something your family and friends will love, yet will nourish their heart, brain, and soul. If it sounds too good to be true, it isn’t, as many of the themes for Thanksgiving are naturally healthy, such as Turkey, baked butternut squash stuffed with wild rice and quinoa, cranberry sauce, mushroom gravy, and mashed cauliflower and potatoes. Serve your loved ones a succulent turkey with moist meat and fabulous flavor. Ideally, order a pasture-raised, organically-fed turkey in advance for your holiday, and don’t be surprised if you need to visit your local health food store to find one. Brining a turkey adds time and an extra step, but it very easy to do, and it really helps prevent the meat from drying out and provides a flavorful delight. Bring 1 quart of water and salt to a simmer to dissolve salt. Then add to a large enough pot for the turkey, combine wine, salt, herbs, peppercorns, onion, and remaining water. Add turkey, cover, and refrigerate for 12 to 36 hours. Remove turkey and pat dry with paper towels. Let stand for 1 hour at room temperature. Place rack on lowest level in oven. Heat oven to 450 degrees. Prepare basting sauce. Combine basting sauce ingredients in a saucepan, heat to medium low heat until combined. Warm gently each time before basting the turkey. Place turkey, breast side up, on a roasting rack in a roasting pan. If the turkey comes with a pop-up timer, discard it; an instant-read thermometer is a much more reliable. Fold wing tips under turkey. Tie legs together loosely with kitchen string (a bow will be easy to untie later). Rub turkey with 4 Tbsp of the smart butter basting sauce. Soak cheesecloth or a small clean kitchen towel in a bowl and moisten with stock, then squeeze it slightly, leaving it very damp. Spread it evenly over the turkey. Place the turkey in the oven. Cook for 30 minutes. Gently remove the towel, warm basting sauce until melted, then using a pastry brush, baste exposed turkey with smart butter sauce. 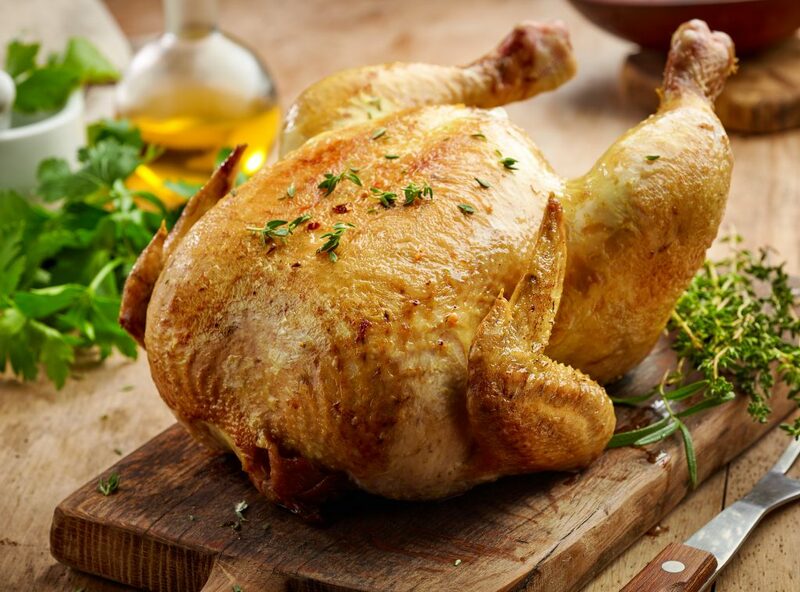 Reduce oven temperature to 350 degrees and continue to cook for 2 1/2 more hours, basting every 30-60 minutes and watching pan juices; if the pan gets too full, spoon out juices, reserving them for gravy. After a total of 3 hours of baking, insert an instant-read thermometer into the thickest part of the thigh. Do not poke into a bone. After a few tests, the temperature should reach at least 170-175 degrees (if you are using stuffing, pack it loosely, the stuffing temperature should reach at least 165 degrees) and the turkey should be golden brown. The breast does not need to be checked for temperature. If the turkey is below 170 degrees, baste the turkey with pan juices with a pastry brush, and return turkey to the oven. Continue to cook and baste every 30 minutes, checking the temperature each time, until it is 170-175. If the stuffing does not reach 165 degrees and the turkey temperature reaches 170 degrees, remove stuffing from the cavity, and bake stuffing separately in an oven casserole pan until it reaches 165 degrees. When fully cooked, transfer turkey to a serving platter, and before carving, let rest for about 20-30 minutes. Meanwhile, make the gravy. Pour all the pan juices into a glass measuring cup. Let stand until grease rises to the surface, about 5-10 minutes, then skim it off. This is a colorful, flavorful, holiday sauce. Serve as a side dish, or over baked squash. I like to prepare it a day in advance, and refrigerate until ready to use. If you want to add a sweetener, I’d suggest a little maple syrup, or if you prefer sugar-free, Xylitol. Sweeten to taste, but be sure to keep it a little tart and not over sweet. If preferred, add maple syrup or Xylitol to taste for sweetness. Heat juice in a saucepan. When gently bubbling, add cranberries and orange, simmer 5 minutes. Add blueberries and simmer another 3-4 minutes until cranberries open and sauce thickens. Remove from heat. Serve warm or chilled. Garnish with mint leaves. Lovely side dish for a Thanksgiving holiday. You can prepare one day in advance, refrigerate overnight, and place in the oven 15-20 minutes before serving. If you add cubed, firm tofu, it would provide a vegetarian main course. Bring water to a boil for wild rice, add wild rice and simmer for 45-50 minutes, until rice kernels start to pop, but still al dente. Rinse and set aside. Bring water to a boil for quinoa. Rinse quinoa in a screen, then add to water, and simmer 15 minutes until tender but still firm. Set aside. Meanwhile, cut squash in half lengthwise, and scoop out seeds and stringy pulp. Place in the oven, cut side down, on an oven pan with sides and bake for 30-40 minutes. (Squash should be tender but slightly under-cooked). Scoop out a depression for the stuffing, leaving at least half the squash remaining, and set aside. Heat a skillet over medium-high heat and add oil. Add leek and mushrooms, sauté for 3-4 minutes. Add herbs, salt, pepper, and broccoli until broccoli is tender but still al dente. Remove from heat. Roast pecans in a pan for 1-2 minutes, don’t brown. Combine half of the cooked wild rice and quinoa with half of the sautéed vegetable mixture, and add pecans, and tomatoes. Then spoon combined mixture into halved squash. Mix the remaining half of wild rice-quinoa and vegetable mixture and place into a serving bowl. Bake squash and rice-veggie mix for 10-15 minutes. (If preparing this with turkey, place in the oven after the turkey has been transferred to the serving platter.) 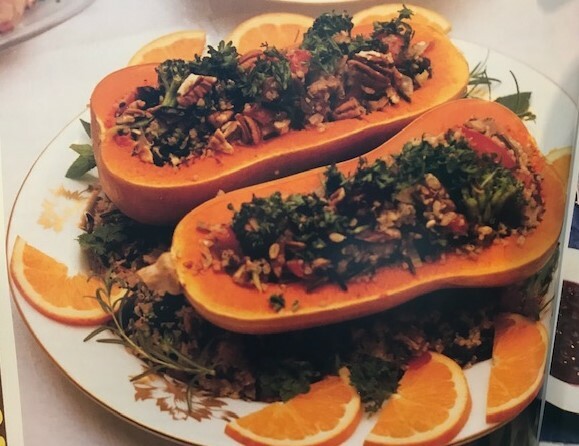 To serve, place stuffed squash on a platter on a bed of remaining rice-quinoa and vegetable mix. Garnish with parsley and cranberries. You can prepare the initial steps in advance, reheat, and add pan juices or hot broth just prior to serving. 1 cup from rack pan juices (pour pan juices into a container, let stand 10 minutes, then skim away grease that rises to the surface, use remaining 1 cup of juice for gravy. If you only have ½ cup of juice, then use 1 ½ cups of stock). If you don’t reserve the juice from the rack pan, substitute with vegetable or chicken broth. Heat a skillet over medium heat, add oil, then onions, mushrooms, and salt and pepper. Stir until onions are soft and golden, about 4-6 minutes. Reduce to medium-low heat, add red wine and Tamari sauce, then add stock and pan liquid, and simmer until it thickens. In a blender, puree mixture until smooth. Serve immediately, or refrigerate and reheat to serve later. Cauliflower and roasted garlic make a terrific addition to regular mashed potatoes. Slice off the very top of the garlic head. Place in a piece of foil and drizzle olive oil inside the head of garlic. Wrap garlic with foil and place on a cookie sheet and bake until tender and fragrant, roughly 35-40 minutes. Remove from the oven and let cool. Peel the outside off the bulb of garlic, then gently squeeze each clove out. Bring a pot of water to a boil, add potatoes and gently boil for 15 minutes. Add cauliflower and boil another 8-10 minutes until soft. Drain. Puree potatoes and cauliflower in a food processor until smooth, add roasted garlic, butter, sour cream, salt and pepper and puree briefly. Serve. I have a holiday cookbook, “Vegetarian Holiday Feasts”. It has recipes for a dozen holidays, including Hannukah, Christmas, and New Years. I think it is a good idea to post some of these as well. Can all of them be eaten by people who have Celiac disease and need gluten free foods? Do I need to substitute any ingredients? Also any ideas for gluten free desserts using pumpkin? Thank you, and Happy Thanksgiving!! Wow, the cranberries blueberries fish sounds great. Sweetener?? Any recommendations?